Tens of thousands were on the march in Istanbul tonight. Perhaps hundreds of thousands. They came onto the streets all of a sudden, in a spontaneous outpouring of anger when they heard the police had moved in to Gezi Park. They came unarmed and peaceful, offering nothing but their voices and their presence. And the police answered them with violence, with tear gas and batons, with rubber bullets and charges. This was Recep Tayyip Erdogan’s application for the presidency of his country, gassing his people in the streets. We saw a child being carried unconscious from the fumes. We saw a middle-aged woman in a headcarf–the sort of good Turkish mother who is expected to vote for Mr Erdogan, standing and chanting against him just as the first sound grenades went off, and the clouds of tear gas started to roll over her head. This, then, is Mr Erdogan’s idea of a modern democracy. You can either agree with him or you can choke in the streets. It began in the early evening. It had been a quiet day in Gezi Park. The protestors were divided: some of them wanted to dimsantle most of the camp and keep only a token presence, after Mr Erdogan agreed to stay the bulldozers until a court decision; others insisted they should stay. They were having meetings all afternoon to decide, quietly listening to each other. The first warning was Mr Erdogan’s speech, or rather rant, in Sincan near Ankara, when he accused the protestors of defiling mosques and attacking women in headscarves, and refused to back down. It was the speech of a madman. The drama was over, Taksim and Gezi Park were quiet, many of the protestors were talking of going home. 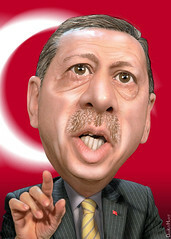 Then came the news Mr Erdogan had irdered them out of the park immediately. Then the news the police were moving in. We were at a party with friends, a typical relaxed Istanbul evening. Immedately half the guests said they were going toTaksim. Others demurred, saying it might be dangerous. It would: but many felt there are times when you have to face the danger. We joined them. Out in the streets, Istanbul was on the march. Thousands were doing the same as us, abandoing parties and dinner plans. Above our heads, people were banging pots and pans from their windows in rage at the news from Taksim. Friends called to say the same was happening all over the city. People were coming from the other side of the square and forming a great mass there as well. People were calling in to say there was tear gas in streets that have never seen it before, in the well-to-do neighborhoods far north of Taksim. There were huge crowds at the bridge over the Bosphorous, crossing from the Asian side of the city. And all around us the crowd was growing. Those who had been on Istiklal for a night out found themselves outnumbered by protestors. Bewildered tourists blinked, unsure what they had found themselves in the middle of. The crowd stretched so far back down the street you couldn’t see the end of it. And it remained peaceful. There was no violence from the protestors, not where we were standing. But that didn’t stop the police. The first we saw of it was a group helping friends who had been hit by tear gas back through the crowd. Then there was some one carrying an unconscious kid. Then there was a loud bang. People began to panic and stampede. Others shouted to keep calm, not to run. Behind us we could see the cloud of tear gas rolling. The police must have fired it at dangerously close quarters. Already many Turks have lost their eyes to tear gas cynlinders fired at point blank range, and one man has had his brains blown out. We made our way into the side streets, the crowd remarkably calm after the initial panic. We saw tourists, confused, heading the wr0ng way, back to the tear gas. We started trying to make our way home thrigh the back streets. But it became a nasty game of cat and mouse, everyone unsure where the police were lurking. The police, for their part, seemed uninterested in who they attacked. They just wanted to spray gas and break heads, You would turn a corner, only to find yourself choking, tears streaming down your face. At one point we turned into a street only to hear shouts of “Run!” and looked back to see police charging at us, with unidentified thugs by their sides. And the news kept coming in. The police had teargassed the lobby of a five-star hotel where visiting German MPs were staying. In Taksim, people were lying down in front of the police water cannon trucks. What the hell, you had to wonder, does Erdogan think he’s doing? Everything was calm, the tensions of previous days had been defused, the protestors were ready to talk. His only answer was violence. Now it has become a contest of will between him and the protestors. But it’s hard to escape the suspicion he is leading his country towards disaster.